(2)	What exists? (Gochberg, p. 453) What is an atom? What is 'void'? (I. 334 ff.) Are atoms created? By whom? Does the Universe have a beginning? An end? (453, top) How big is it? What is movement' like? (3)	What do the Epicureans mean by 'Chance' and 'Fortune'? What is the importance of Chance in the Epicurean system? (4)	Do the Epicureans have a god? Can there be more than one? (Cf. 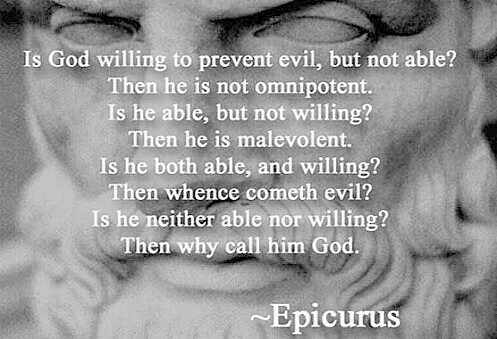 Epicurus' maxims [below], from the Life by Diogenes Laertius) If so, what are they composed of? Are they 'spirit' (Answer is, in fact, NO)? How do they become and stay gods? Are they interested in human beings? (5)	What is the Epicurean view of 'Religion'? What is the usefulness of: (a) temples, shrines, altars; (b) the Rev. Clergy; (c) prayers ? (6)	What is the Epicurean explanation of the significance of 'death'? (III. 530 ff). (7)	What is the Epicurean afterlife like? What is the relationship between a dead Epicurean and his family? Other living persons? (9)	On what principles does an Epicurean base his ethics? -Would an Epicurean be willing to be a town magistrate? -Would an Epicurean be willing to be a municipal priest? -Would an Epicurean be willing to be a soldier or officer in the army? -Would an Epicurean be willing to be a Senator of Rome? -Would an Epicurean be willing to be a member of a cult (Christianity, Mithraism, Isis Worship)? -Would an Epicurean be willing to be a teacher? -Would an Epicurean be willing to be a lawyer? #1	A blessed and eternal being knows no inquietude himself, and brings no disturbance to anyone else. Thus, he knows movements neither of anger nor of partiality, for all such movements point to weakness. #6	Any means of obtaining security from other men is a good according to nature. #9	No pleasure is in itself evil. But the things that produce certain pleasures involve inconveniences much greater than the pleasure they produce. #19	If the bounds of pleasure are measured by reason, then a length of time--short or long--affords equal satisfaction. #27	Friendship is the most important of all the means counselled by wisdom for securing happiness. #33	Absolute justice has never existed. There have existed only reciprocal agreements, at different times and in different places that provide against the infliction of pain or harm. A discussion of Epicureanism: John M. Rist, Epicurus: An Introduction (Cambridge 1972).